What better way to mark the end of another fantastic year at Glow than to look back at some of the ‘Epic Projects of 2018’. It’s December! We’re not sure how that happened, but it’s here and we’re officially counting down to Christmas and New Year in the Glow studio. 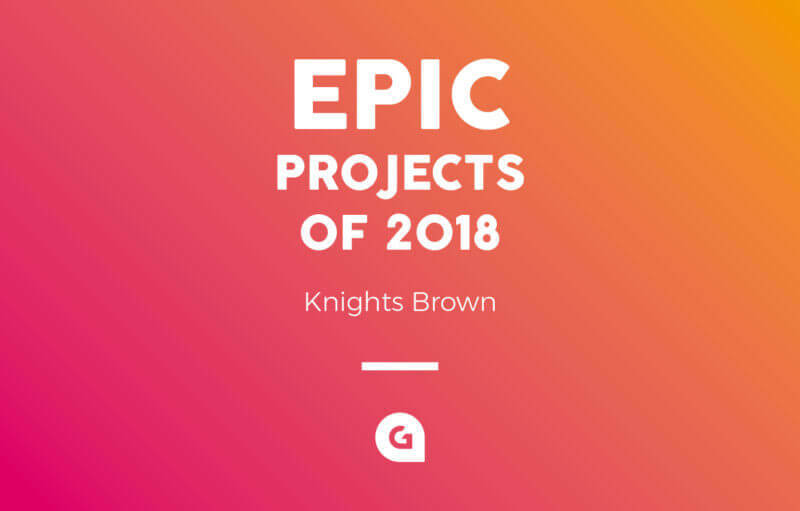 What better way to mark the end of another fantastic year at Glow than to look back at some of the ‘Epic Projects of 2018’. We couldn’t possibly talk about the epic projects of 2018 without mentioning Knights Brown. If you follow us on social media, have taken a look at our online portfolio or keep track of our blogs, you’d be hard-pushed not to already know a little about Knights Brown. Glow was tasked with coming up with a new name and brand identity for the construction company back in 2017 and Knights Brown officially launched on 1 September 2017 with a Glow-designed website, brand guidelines, stationery, clothing and vehicles. The Knights Brown team certainly haven’t sat back since the launch of the new brand and have been keeping us busy with some fantastic projects this year. Upon writing this blog, we’ve completed 44 projects in 2018 for Knights Brown, and there’s still a few more to be completed before the end of the year. It’s not just the marketing and communications teams we work with, we also work with the bid team to design professional bid documents with a bit of added flair. Due to the sensitive nature of the bidding process, we can’t share images of the bid document itself so you’ll have to trust us that the documents look amazing, but we can give you a sneak peek of one of the custom boxes that Glow designed to house the Glow-designed Knights Brown bid documents recently – it featured a pop-up element! This was another fun one. Knights Brown has a lot of vehicles on the road, and no matter the weather outside, Knights Brown wanted to promote the importance of keeping a cool head while driving. 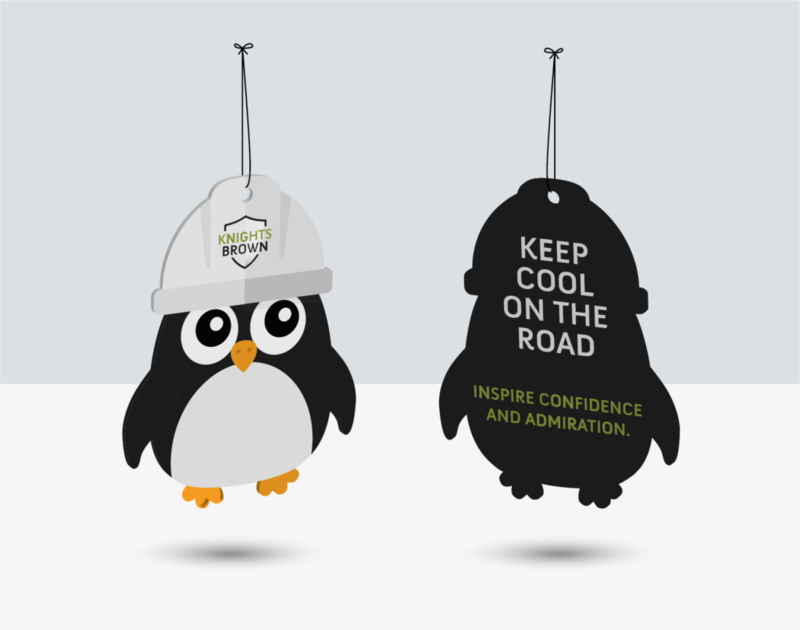 Glow designed a fun, cartoon-style penguin and polar bear which now adorn company vehicles, keeping the vehicles smelling fresh and acting as a gentle reminder to remain cool and calm while driving. 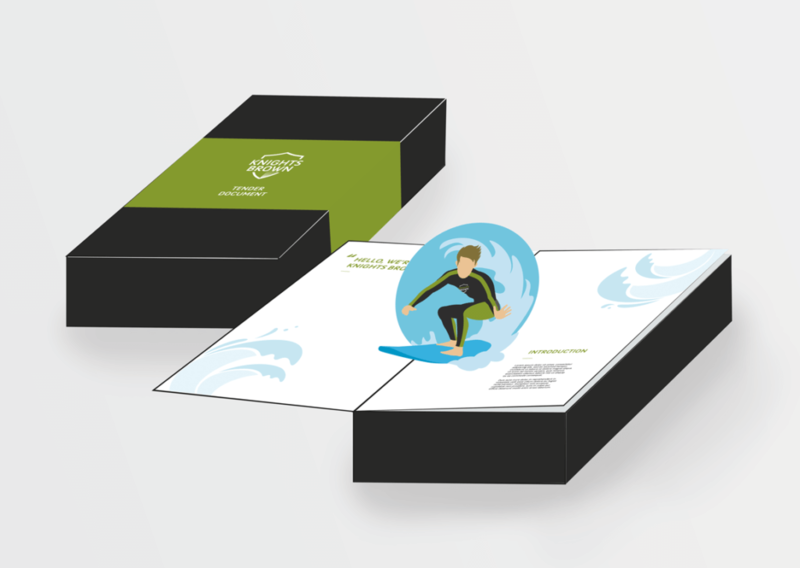 Ensuring brand consistency and continuity is a top priority for the Knights Brown team and their corporate literature reflects this. 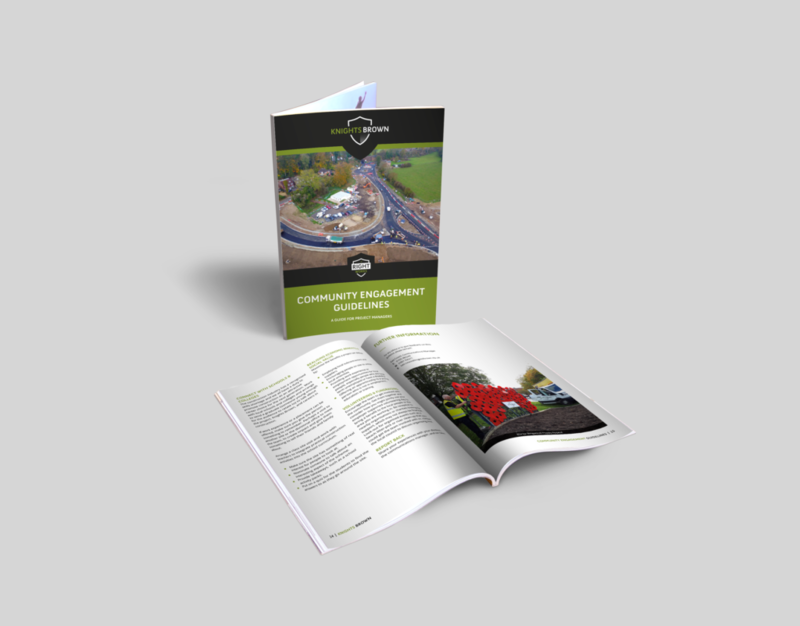 We’ve re-designed many documents over the past 12 months including Community and Careers Publications, Guiding Principles and Capability Statements. Yes, we know that the Knights Brown brand was only launched in 2017, but the company itself has a strong heritage and their Wales & Energy division celebrated their 10th anniversary this year. We designed a celebratory logo and invitation to the 10th anniversary party for employees. 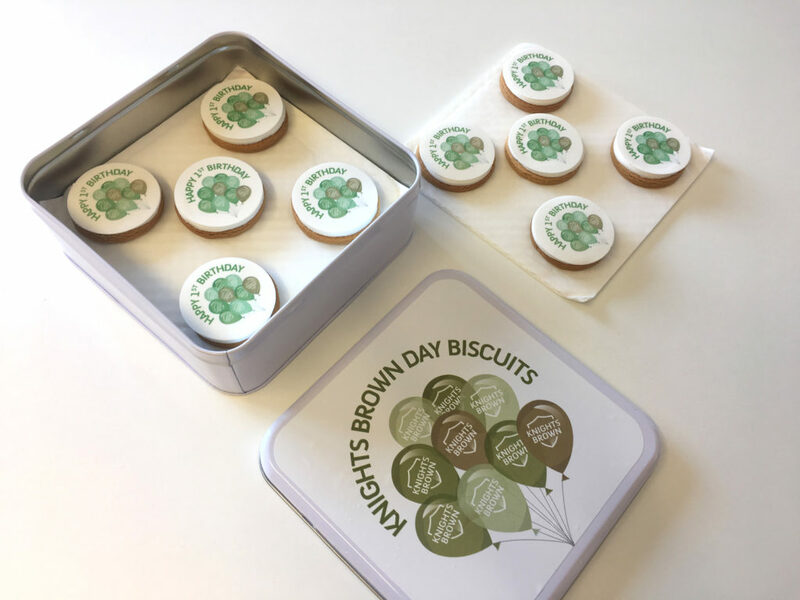 On 1 September 2018, Knights Brown celebrated its first birthday, and Glow was tasked with creating artwork to be printed onto a tin of biscuits. The Knights Brown team were kind enough to send the Glow team a tin, they didn’t last long! *This is not what we’re doing in the Glow studio, we’ve very busy and hard at work!